It’s a while now since I finished reading this great little book on the global warming scare, and other non-climate demands have subsequently prevented me from reading it again, so unfortunately this is more of a recommendation than a full review. 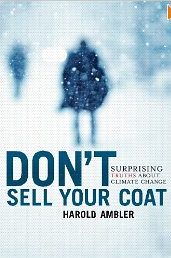 However, if you want a clear, very readable and straightforward exposé of the alarmism of climate science and the media, the myth of the green economy, the ostracising of dissenters and the myriad other distorted facets to this key issue for the 21st century, ‘Don’t sell your coat’ ticks all the boxes. It’s available on Kindle as well, for just US$9, so you can start reading it today. Harold also blogs at Talking About the Weather here – one for your bookmarks. ‘Don’t sell your coat’ is available from Amazon here. I am fed up with filling up the trough for climate alarmists who use fear to generate money to go on junkets like Rio. Bravo Julia, Flannery, Swan and other members of Fifth Collumn! JOHANNESBURG (miningweekly.com) – The first shipment of coking coal from Rio Tinto’s Benga mine, in Mozambique’s Moatize basin, left the Port of Beira on Monday. The 34 000 t shipment is bound for an Indian steel mill. “Today’s shipment marks an important point in the phased development of our tier-one coking coal resources in Mozambique. It is the first step towards our aim to become a significant supplier of hard coking coal to the seaborne market,” Rio Tinto Energy CE Doug Ritchie said. The Benga mine, a joint venture between Rio Tinto (65%) and Tata Steel (35%), is located in one of the world’s most prospective coking coal regions, he added. “We are continuing to work with the government of Mozambique to secure the development of comprehensive infrastructure for efficient transport of coal from mine to port, which is a priority for the further development of the region,” Ritchie said.